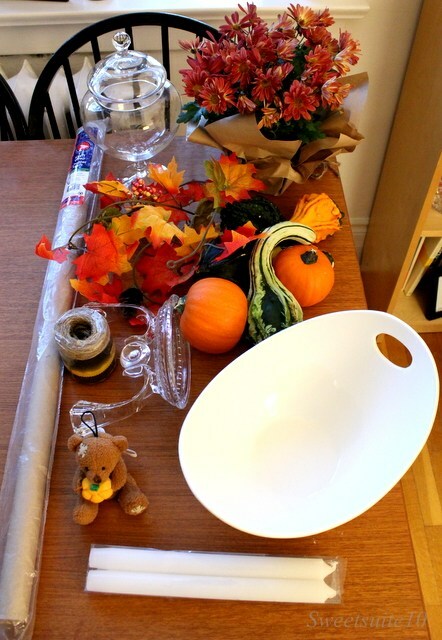 On Monday I told you about the fall decorating challenge that has been organised by Jeanette at This Dusty House, and how I was a bad blogger and didn’t get my shopping and planning done on the weekend. Well, yesterday after work (because while I planned on going to the dollar store at lunch I had to go to a meeting instead – drat) I made a mad dash to the dollar store and tried to figure out what I was going to use to decorate my mantel/bookcase. It was HARD!!! It might be because Dollarama had a lot more Halloween items than ‘Fall’, but it’s more likely that I’m not great at trying to decorate on a deadline – I like to think and rethink my decor choices before making a decision (ahem - exhibit A, the chairs I bought over a year and a half ago and haven't touched yet). I’m not quite sure how I managed to only spend $11 as I was absolutely positive I was going to blow my $15 budget. Maybe it helped that the surface I chose to decorate is fairly small so I couldn’t do a lot with it. What do you think? Was I somewhat successful in this challenge, or should I steer clear of all seasonal decorating from now on? Don’t forget to see what the other bloggers participating in the challenge were able to do – click on the links below to visit their blogs. Looks great! I love this challenge. I LOVE IT! And now I think I need to check out my little local grocers to see if I can find some of those amazing gourds and the little mum for so cheap. All the ones I've seen have been huge and, well, still cheap, but, you know - huge. Also, I love how you brought the little teddy bear in. Such a cute little detail! This looks awesome! I love that you successfully followed the challenge, unlike myself. Hah. I am so into the local grocer stuff, decorating with nature is the best, especially since Fall means so many awesome colours! Yay! Very pretty! I love all the colour you used (despite going neutral myself, haha) and that mirror is so pretty. I really like they way you disguised the flower pot too, I have to try that! I swear, all of you guys have much better Dollar Stores near you than I do. I ended up going to Tuesday Morning and shopping the clearance aisle at TJ Maxx. I also added some grocery store items. Which reminds me, I need to post my reveal. I love all the orange! It all turned out so pretty! 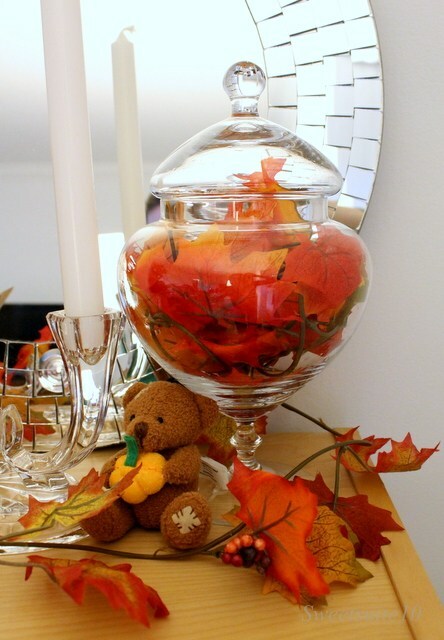 I also bought leaves and considered leaves in a beautiful jar like that, but the colours didnt work for my space. Love it for your place! so pretty! 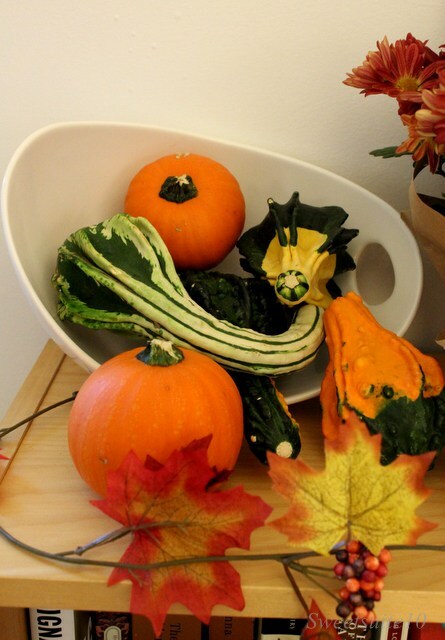 I saw little gourds at the Loblaws superstore last night, so I think a lot of places have them. The little mum plant surprised me - I too had only ever seen thm in mammoth 'use me on your front porch' size. The dish that the gourds are sitting in is just perfect! The way you balanced the colours with neutrals, it looks very well put together. 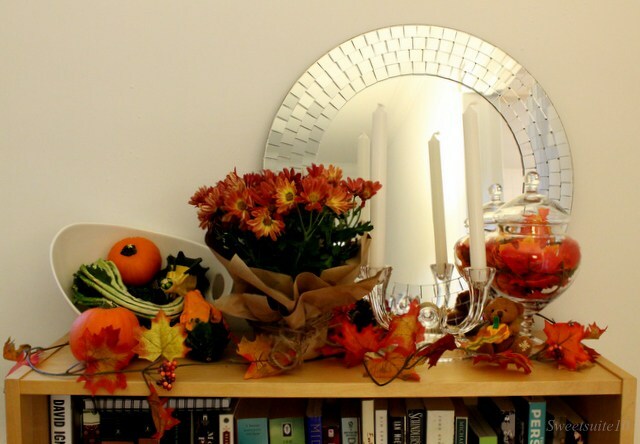 You should definitely keep on seasonal decorating. 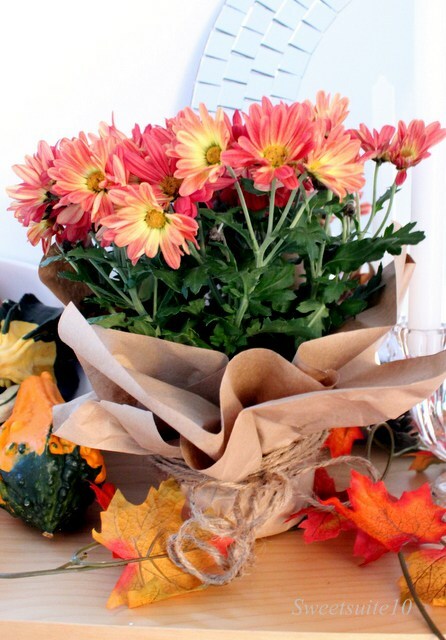 This looks lovely and all on a reasonable budget! So cute!! I love the color combination and the creativity.